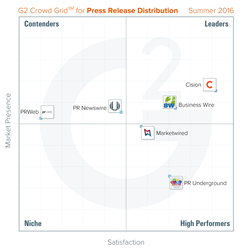 G2 Crowd, the world’s leading business software review platform, today released the Press Release Distribution Software Grid report to help businesses make the best press release distribution technology decision. Cision and Business Wire were named Leaders in the report, receiving strong customer satisfaction scores with a large market presence. Marketwired and PR Underground were named High Performers in the report, earning strong customer satisfaction marks with smaller market presence scores. Cision earned the highest overall satisfaction score and the highest overall market presence score. Media targeting is key — Reviewers consistently noted the importance of being able to target specific news outlets and media members with press releases. Growing social importance — Users praised press release distribution tools with strong social sharing features. They said that growing social media influence makes social sharing more important than in the past. Reporting requirements — Reviewers of several press release distribution products mentioned that they would like better reporting and analytics tools. They said that the ability to measure the reach of press releases for themselves or clients is key to understanding the value of the tools they use. The report is based on more than 440 reviews written by business professionals. Of the 26 products listed in G2 Crowd’s Press Release Distribution category, the ranked products each received ten or more reviews to qualify for inclusion on the Grid.